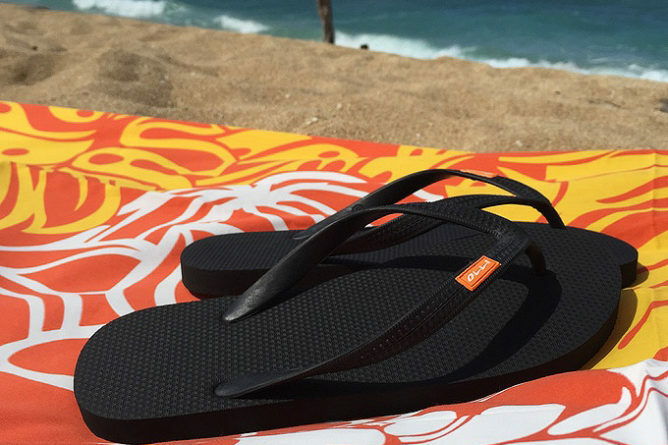 In July 2014, Heather Shuster forgot to bring along her flipflops on a trip to Hawaii, so she did the logical thing: she looked for a new pair. You’d think it would be easy to find a great pair of flipflops given where she was, but all she found were flipflops made with plastic. That incident sparked an idea: to create eco-friendly flipflops made with natural rubber and won’t harm the planet or the skin. Olli was born. I joined the Fair Rubber Association, which means Olli only purchases rubber from audited plantations that maintain Fair Trade standards that include safe working conditions, medical care, and a fair wage. We pay a premium for our rubber which goes directly to the rubber tappers. The goal now is to raise $10,000 for production. If all goes according to plan, production begins in April and the products will be shipped to backers in July. Check out the Kickstarter page for more details and maybe help Heather out as well in creating these eco-friendly flipflops. Photo from Olli’s Kickstarter page. Italian brand Gucci is getting ready to launch its Sustainable Soles line, which is coming out this month. The line features shoes for both men (sneakers) and women (ballerina flats), and have been designed by Frida Giannini, the company’s creative director. So what makes the shoes green? The flats were made with biodegradable plastic, and the sneakers were made with vegetable-tanned calfskin, bio-rubber soles, and bio-strings. The shoes will be available online and in Gucci stores around the world.